We understand that with plenty of safety standards and practical design factors to take into consideration, designing a laboratory is no easy feat. That’s why we have compiled our most popular products for laboratories in one place, so choosing your power solutions can be hassle-free. 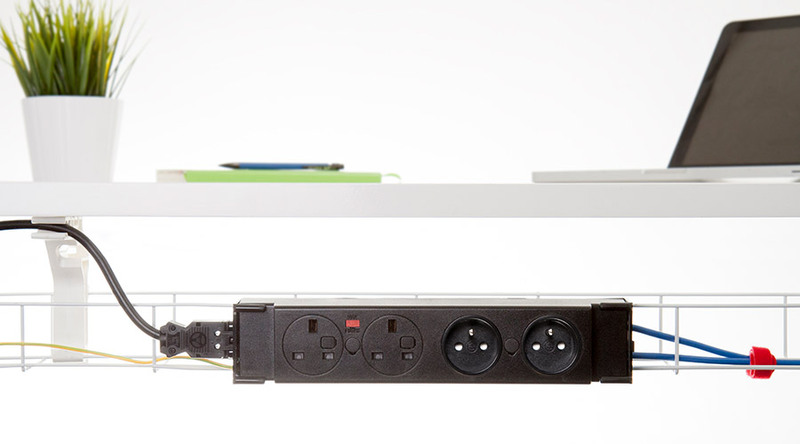 For ultimate ‘neat and discreet’ power, look no further than our versatile integrated units. Quick and easy to install, these units are suited to workbenches and meeting tables, designed to keep your work surface clear when not in use. PIXEL & PIXELTUF discreetly present both power and either two data or AV connections or our TUF A+C 25W USB charger, in an ultra-compact form, with angled sockets designed to prevent liquid ingress. Meeting the growing need for easily accessible connectivity, PIXEL takes up almost no room at all, easily fitting into a standard 80mm grommet. You may even forget it’s there until you need it. PANDORA offers 360 degrees of power, perfect for sharing. The unit fits neatly into a 128mm grommet hole and has a near flush profile when closed and not in use. As shown, PANDORA simply rotates to close and open and can be fitted with TUF-R A+C charging and international socket options. Decorative inlays are available including a range of colours as well as brushed stainless steel inlays. Frameless and near flush, AXXESS and AXXESSPLUS are the ideal solutions for those who require an all in one power and data management solution without an elaborate aesthetic. Simple and stylish, the spring-loaded lid is designed to close during use so that the power and data compartment can remain concealed. Helpful guides direct the cables to the front of the unit, preventing them from becoming damaged during use. The unit also features a handy cable storage compartment. Both units are easy to install without the need for screws. AXXESSPLUS can also be ordered with a recessed lid, so you can seamlessly match the unit to your surface with a veneer or inlay. Designed to operate in its closed position, our popular in-desk power unit, PRISM, is particularly suitable for locations where space and uncluttered appearance is important. Flush fitting when closed PRISM smoothly rotates with light pressure to reveal your chosen combination of power. Laboratories must provide adequate charging ports for multiple users, as well as a variety of equipment. OE Electrics products are available with a combination of AC Power, Data and USB charging to suit the most demanding project requirements, ideal for areas used simultaneously by multiple workers. 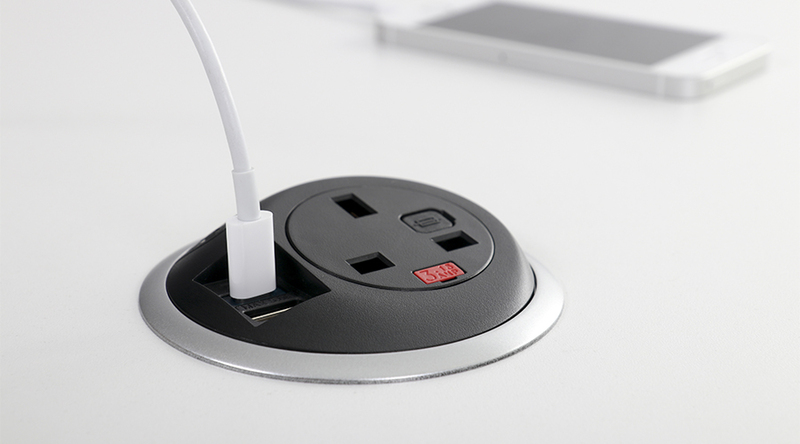 With 3 outlet positions, PLUTO is perfect for a small team to power or charge their devices using conventional mains plugs, twin USB ports or any combination of the two. PLUTO’s unique domed shape has made it a firm favourite amongst customers across various market sectors. Available in many colour finishes to suit your space, PLUTO is infinitely customisable, available with immersion transfer graphics or printed with a custom image or logo. PolarICE rewrote the design rules for desktop power when we launched it in 2008, and continues to be one of our best selling products 10 years on. Clip-on moulded front and rear decorative frames with circular socket apertures create an original and distinctive design perfectly matched to contemporary settings. 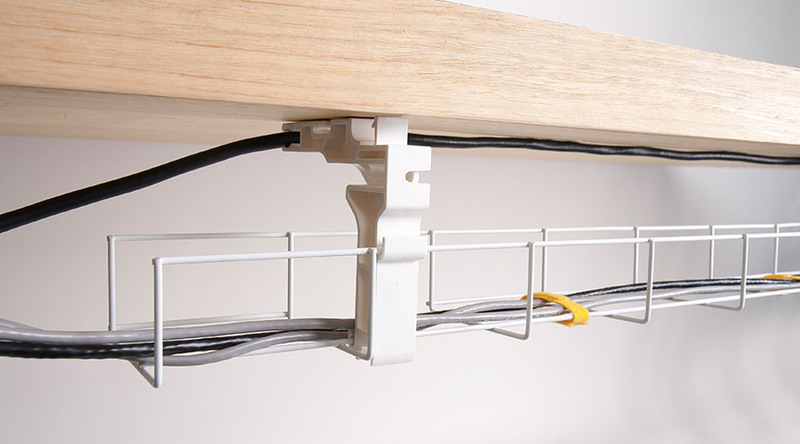 A range of bracket options are available for quick installation of PolarICE on desk tops of varying thickness, to monitor beams, equipment rails and furniture panels. Providing power to our units couldn’t be more straightforward. We offer tried and tested solutions for vertical and horizontal cable management, and anything in between! PATHWAY is a modular cable tray available in 600mm and 900mm sections Supplied with a pair of white moulded PATHWAY BRACKETS, the unit can be quickly fitted to the underside of a desktop or to a modesty panel. Power and data cables can be easily segregated, with handy twin cable retaining slots and sections which can be double stacked. A range of OE Electrics power modules will snap onto PATHWAY with additional clips. POWERBAR is an ideal accompaniment to PATHWAY. This tough fire-resistant socket power unit is built with the quality and reliability expected of an OE Electrics product, all at a competitive price point. The unit can be configured with USB charging, power and data sockets. 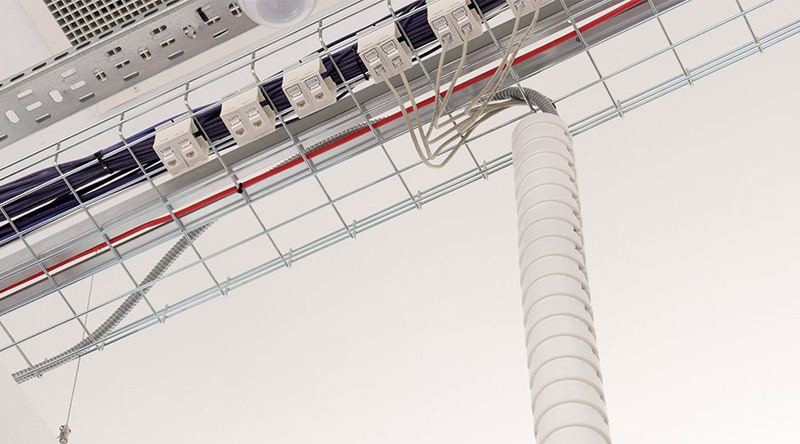 Designed for spaces that require more sophistication than a standard suspended cable tray. 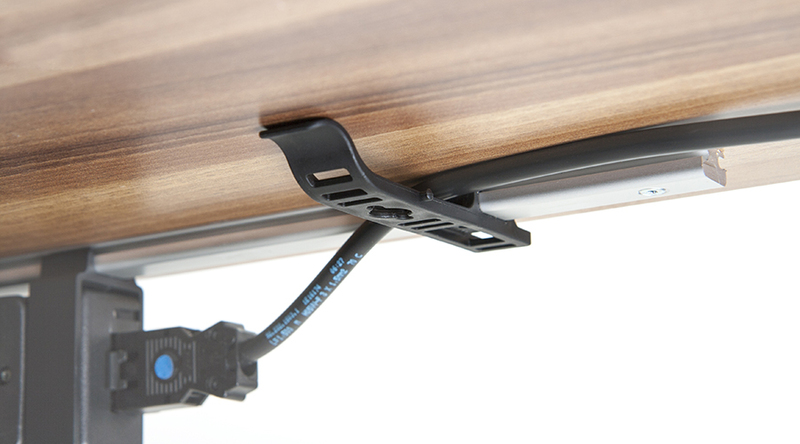 A solid aluminium mounting rail is installed underneath the tabletop, allowing for different clips to secure your cables in place. Pairs perfectly with our POWERBAR or PATHFINDER units. 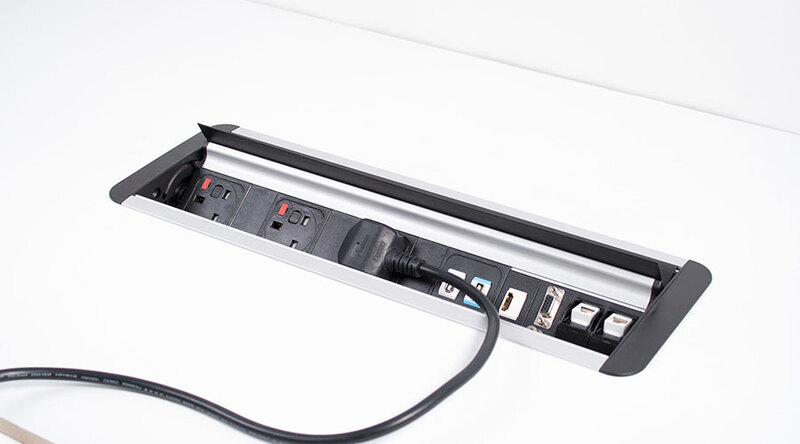 The PATHFINDER system is a flexible umbilical which has been designed to offer a complete floor to desk, floor to ceiling or ceiling to desk cable management solution with a wide range of fixing options. PATHFINDER is available in white, silver, black or clear polycarbonate. When OE Electrics’ manufacturing facility (OE House) was created, it made perfect sense to incorporate our own products in the design, especially for our purpose built Research and Development Laboratory. AXXESS, PANDORA, and PASCAL were chosen for in-desk power, all enabling the work surface to remain clear when not in use by either pushing, flipping, or closing a lid. A free-standing POSE provides conveniently locatable USB charging anywhere in the room, and a custom-built 3-meter long POCO unit frames the counter-tops, providing both mains and USB power. Tasked with creating a complete relocatable furniture solution, laboratory furniture company Marson designed the SMARTLab system, designed to adapt to the ever-changing requirements of the laboratory environment. 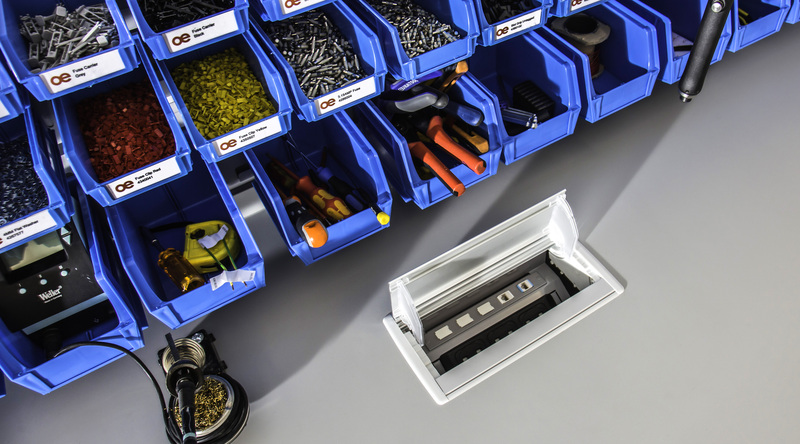 We supplied them with PATHFINDER, a flexible service connection into ceiling infrastructure and modular cable tray PATHWAY to keep cables neatly out of the way at a lower level. We also provided the electrics to a bespoke service mast solution that would offer plenty of power outlets with individual switches. Marson’s bench-mounted service masts are designed to meet specific electrical and gas requirements. OE Electrics assisted by pre-wiring RCD protected electrical sockets and thoroughly testing them. These were then swiftly installed into the pre-machined cut-outs in the bench surface on site. This page represents just a small selection of what OE Electrics has to offer. We also provide custom solutions and always welcome feedback. Return to our homepage to see more of our products, or fill out the enquiry form to find out more about how we can help.